Whenever the sun comes out, so should a pair of personalised sunglasses. Effortlessly cool and printed all over with your designs, they're the ultimate style statement. Your shatterproof plastic custom sunglasses are printed and hand assembled to order in London, UK, guaranteeing an excellent finish and a one-of-kind product. With 100% UVA and UVB protection, fade resistant properties and 6 areas to customise, these funky sunglasses are a must-have accessory for any wardrobe or fashion brand. Printed all over with your artwork, illustrations or graphic designs, custom sunglasses are the hottest way to showcase individual style. A pair of cool sunglasses is an essential accessory for both men and women universally, so design your own sunglasses to stand out from the designer brands. Made from shatterproof plastic with 100% UVA and UVB protection, these are fashionable yet functional, allowing you to express your personality without compromise. Make your own sunglasses as a complementary addition to your clothing brand, or simply design a pair of shades to add a touch of 'wow' factor to your outfits. Please note, because of our hand-pressing printing process, darker colours might be slightly stretched, giving them a slightly desaturated appearance on edges and corners. As we press every pair of sunglasses by hand, the alignment might vary +/- 1-3mm. We therefore always suggest using a repeat pattern, where alignment does not matter so much. Avoid text. This will ensure your sunglasses look stylish, unique and individual just for you. Our specialist digital printing process binds the ink to the shatterproof plastic, creating a long-lasting, fade-resistant print; ideal for everyday use in the sun. Hand assembled by a team of skilled technicians here in London, UK, your made-to-order custom sunglasses are truly unique. Use illustrations, original artworks, graphic designs or drawings to turn what's an often neutral accessory into a talking point. There's no minimum order, ideal if you want a pair of bespoke shades for personal use, or need a range for your fashion brand. 2-year guarantee. Design a colour coordinated case to complement your personalised sunglasses, so you always look good even when on the go. Paired with a chic hat and summer ready clothes, a pair of customised shades is the finishing touch to any outfit. 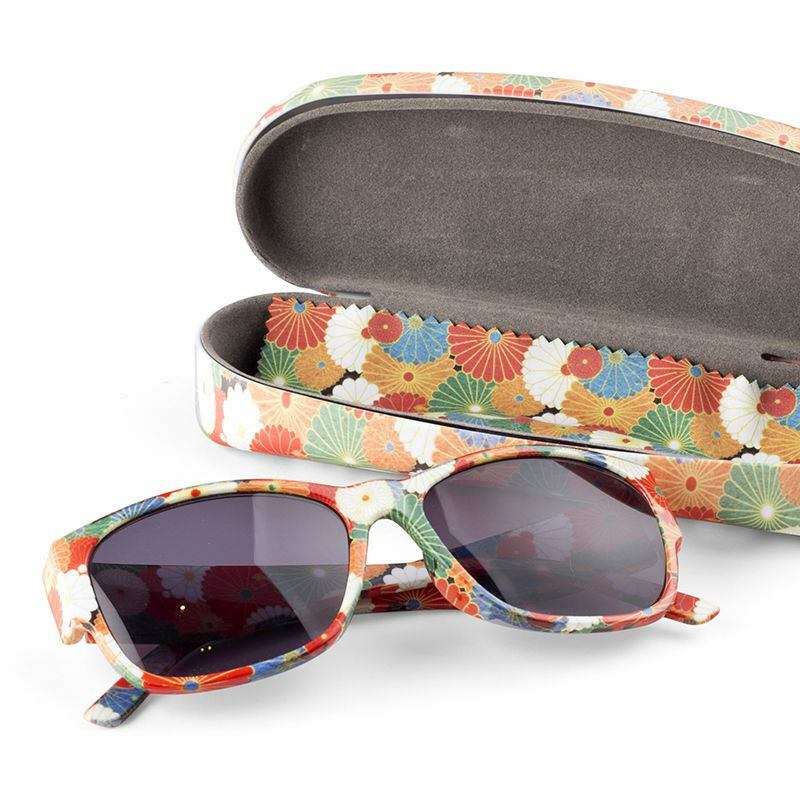 Not just for holidays though, printed sunglasses look great all year round, whatever the season. Create a tropical design to perfectly suit days at the beach, or print a geometric, retro design to add another dimension to your everyday style. Make your own sunglasses and brighten up your vibe even on the dullest of days. Great service and good products on the whole I was delighted with the black and patent leather vinyl handbag, the bone china mugs and the sunglasses were outstanding. I was, however, extremely disappointed with the Italian nappa leather zip top handbag. Inside beautiful but the finish outside looks like PVC. Fun sun glasses Delighted with my sunglasses. Light and easy to wear. Much admired by others. Very fast delivery. Only thing I miss is a box to keep them in when it's not sunny. CONTRADO : we can do matching case too! What Size are My Personalised Sunglasses? Our custom made sunglasses come in one size: Width 14.5cm x Length 15cm x Height 5cm. The classic shape makes them perfect for both men and women, complementing any face shape or hair style. All over! You get to design the front, back, right arm outside and inside, left arm outside and inside, and each area can be personalised with a different design. Your custom sunglasses are printed entirely with your designs, so have fun creating a pair to suit your style.